Twitter has finally published its “promoted tweets” – the company’s money making advertisements on its website. The first ad was bought by Disney to promote its upcoming movie Toy Story 3. 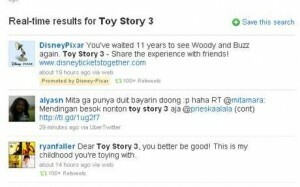 Toy Story 3 became a “trending topic” for which an advertiser pays for it to be there. Disney is just one of the partners for Twitter working with many other major brands such as Best Buy, Starbucks and Walmart. Clicking on the ad or trend as they call it, makes the user to search for the topic and know more about it. A “promoted tweet”. Twitter has been slow on making profit from its business and for a long time failed to explain its business model. While the progress has been slow it has finally materialized and now the company says that its aim is to make that a successful business model. Twitter acknowledged that the process was complicated and it could lead to a lot of confusion. The code itself was extremely complex to work with and slipping ads and then tracking them could be quite a challenge. Well for now we all will start seeing ads on Twitter, hopefully we won’t have to deal with over crowding of ads! Previous Forget Bullet proof vests, now its Bullet-Proof T-Shirts!!! Next Make your own iPad for $400! !